Monday’s mornings headlines of the encouraging progress in the peace talks between Israeli PM Ehud Olmert and PA President Mahmoud Abbas could not have been further removed from the negative sentiment resulting from the recent delegation of 23 South African ‘human rights’ activists to Israel. The delegation was organised, at least in part by former head of Habonim South Africa, Doron Isaacs. The tour played out as expected – it was perfectly scripted to show the very worst of the Israelis – devoid of any context – leading the delegation towards a conclusion that was designed and orchestrated from the very beginning. In a great propaganda play, they essentially mapped the tour backwards from the ideal outcome, to the initial setup. As a quick disclaimer, I want to add that my disappointment with this tour is directed not towards the delegates themselves but towards the organisers and funders of the delegation. The delegation was problematic on a number of levels. First of all, what was the justification for such a tour? There already exists a UN Human Rights Commission Special Rapporteur on Israel who is tasked with studying and reporting on Israeli abuses (and only Israeli abuses I might add) of Palestinian Human Rights. Israel is also the only permanent item on the UN HRC agenda. What value could this delegation have possibly added? When searching for this justification we need to consider whether the funding could have been better spent elsewhere. That said, the private funders have every right to spend their money where they see fit so perhaps this angle is slightly argumentative. On a similar note, should Israel consider sending a delegation of activists to South Africa to analyse what led to the recent attacks on foreigners on our doorstep given Israel’s outstanding record at absorbing refugees? Secondly, we must question what the aim of the delegation was? They claim that they were there to ‘help’ Palestinians and Israelis begin building new bridges. I think its hot air and I’ll explain why. The itinerary of the tour did not provide the delegation with a balanced picture. Like the mandate of the UN’s Special Rapporteur on Israel, they only dealt with Palestinian human rights (infringed by only Israel and not the Palestinian leadership) and totally ignored the abuses suffered by Israelis. The absence of a visit to Sderot was certainly eye catching. Perhaps safety was the reason...I guess the organisers of the tour trust the Israelis more with their safety in Palestinian areas than they trust the Palestinians with their safety in vulnerable places like Sderot. In contrast, no comments were made about the religious extremism of the Palestinians. Are Jews the only party in the conflict afflicted with religious radicalism? Can we take a delegation that fails to discuss the part played in this conflict by radical Islam – the indoctrination of the youth into a cult of violence and suicide – seriously? Are they really building bridges as they claim...or are they harming existing bridges that have allowed the serious talks between Olmert and Abbas to progress? Experimental psychologists long ago confirmed that adverserialism is a pervasive and deep rooted human tendency. I can’t help but suggest that it was this tendency which hardwired the delegation’s itinerary. We have to recognise that psychological biases get in the way of analysing emotional conflicts and the tour should have worked hard at recognising and working at them. The biases were set from the get-go –and the itinerary only served to reinforce them -- not to overcome them. In the Sunday Times this week, editor and delegate on the tour, Mondli Makhanya, presented the first local editorial about the delegation’s tour. The editorial tells a black and white story about a violent occupying aggressor (Israel) and a poor oppressed victim (the Palestinians). The good Israelis are the ones that refuse to serve in the army. He adopts the lexicon of the Palestinians, calling the Israeli Defence Forces the Israeli Occupation Forces, and sneaks in – without any attempt at challenging - a second-hand comparison between the Holocaust and the suffering of Palestinian prisoners in Israeli jails (he fails to point out a single Israeli gas chamber mind you). Makhanya concludes with a call to help build bridges between Palestinians and Israelis. Sadly, his calls will go unanswered. The important messages he needs to relay will have zero impact on mainstream Zionists. The lack of balance will force most of us to see his message as adversarial in nature – the delegation’s final message praises groups like “anarchists against the wall” without affirming the threat facing Israel which caused them to build the barrier in the first place. The one-sided nature of the tour will unfortunately compel most Zionists to ignore all of their feedback, even when they are right. If Makhanya and the rest of the delegation really want to build bridges then they should attempt to understand both sides of this conflict – they should be aware of the suffering not just of Palestinians; but of Israelis too – a suffering that forces the stringent security measures that they recently witnessed. Before Makhanya left for the tour, he made a comment about Israel being evil in the context of an editorial on Zimbabwe. Sadly, this tour never challenged his preconceived mindset. I have to add, that many of the tours I have been on have also not been balanced – portraying only Israel’s perspective. However, it is something I was always aware of – the tours I have been part of have never pretended to be neutral. I can say though that the books on my bookshelf are evidence that I have challenged my preconceived biases. Many members of the delegation are great intellectual minds who have made real positive differences to the new South Africa. I only hope that their analysis of what they saw takes account of what they did not see. A lot has already been said about Jimmy Carter’s controversial book “Palestine: Peace not Apartheid” and seeing as I haven’t yet read the book there is not much I can add. You can access a roundup of commentary on Carter’s book at CAMERA. I have always been a great fan of former US envoy to the Middle East, Dennis Ross. His criticism of Carter’s book for me is the most damning, given the prominent role he has played in the history of the region. Dennis Ross was involved in almost every negotiation that took place between Israelis and Arabs between 1988 and 2000. He was the architect of the Camp David and subsequent negotiations of 2000 that came so close to bringing peace to the region. Dennis Ross is far from a right wing Zionist. He is a man who supports both the Israelis and the Palestinians and few have been more committed than he has towards achieving peace. He puts the blame for the failure of the 2000 talks squarely on the shoulders of Yasser Arafat. He also openly admits to having watched the 1999 Israeli elections with Abu Mazen (Mahmoud Abbas) and celebrated with him when the news of Bibi Netanyahu’s defeat came through. Dennis Ross is indeed a man who supports both sides and as far as the Middle East conflict is concerned, is as neutral as you can get. It never ceases to amaze me how confused people are over what took place in 2000. People tend to refer almost blankly to “the disputed Camp David proposals”. Both Zionists and non-Zionists seem equally confused. In July of 2000 the Camp David summit took place. Various offers were put forward by the Israelis and the Americans but these offers were rejected by the Palestinians. Later in the year, in December 2000, at the request of Israeli PM Ehud Barak, US President Bill Clinton proposed what became known as the Clinton parameters. These went further than any of the offers (in terms of what Israel would relinquish) at Camp David. Ehud Barak and the Knesset accepted these parameters. Arafat rejected them without making any counter offers. 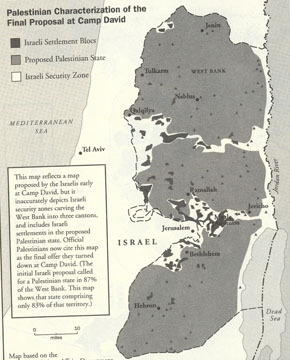 Jimmy Carter has tried to deceive the public by portraying the Clinton parameters as the Israeli interpretation of the Camp David offer and by portraying the partial Israeli Camp David proposal (substantially less that what they accepted via the Clinton parameters) as the Palestinian interpretation of the Camp David offer. In doing so Carter is creating the impression that the Camp David offers were so ambiguous that rejecting the offers was the only realistic option available to Arafat. Whilst there were differing Israeli and Palestinians versions of what was actually offered at Camp David there can be no argument about what was proposed as part of the Clinton parameters because Clinton himself documented them! They are available in print for anyone to see (not the maps, although Dennis Ross created his versions of what the maps would resemble, but the text of the parameters is available in print). Please be sure to take a look at the actual maps from Dennis Ross’ book at this previous IAS entry : The Rejected Maps. 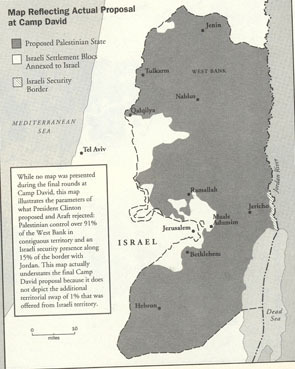 The maps show the Israeli vs. Palestinian interpretations of the final Camp David proposals as well as the map that reflects the Clinton parameters of December 2000 (repeated below). The Pony or the Manure? When looking at the Middle East you can either see the pony or you can see the manure. I myself am not certain what I see, but I lean towards the pessimistic outlook. Ross however, sees a pony. He relates the three factors that create an enormouse opportunity for peace. Without doubt the greatest and most enabling change has been the death of the inveterate obstacle to peace, Yasser Arafat. Ross knew Arafat well. He knew how Arafat operated and he knew the impediments to peace that Arafat constantly engineered. Ross said that his most painful lesson throughout Oslo was the realisation that no change was possible whilst Arafat was alive. Ross said that this analysis is not an argument; it’s an observation. Whilst travelling through Gaza during the mourning period for Arafat Ross saw pictures of Sheikh Yassin and of Mahmoud Abbas, but none of Arafat. Let me repeat that. During the period of mourning for Yasser Arafat there were virtually no posters of Arafat in Gaza – his own people didn’t mourn him. Near the end of the mourning period at Arafat’s Muqata compound in the West Bank where Arafat was buried Ross saw no people at the grave. There were no physical signs of people mourning Arafat’s death. Ross reiterated that this is an observation and not an argument by turning to some statistical polls. Before Arafat’s demise the percentage of Palestinians optimistic about their future sat at 35%. Within weeks after his death the figure shot up to 60%. What does it say about a leader when his death makes his people more hopeful? Arafat gave the Palestinians a past but he could not give them a future. Ross said the second sign of hope is the leadership of Mahmoud Abbas. Ross said that Abbas has consistently been in favour of a secular Palestinian government and is the only real leader to have spoken out against violence in Arabic – not just English. In contrast to Arafat, Abbas has never created pockets of power for himself. For me the jury is out on Abbas. Abbas has at times shown signs of cooperation with Israel, but he has also frequently failed to act on intelligence provided by Israeli security forces. The third hopeful factor is the decision taken by Israeli PM Ariel Sharon to disengage from Gaza and northern Samaria. Ariel Sharon’s courageous disengagement plan has created a window of opportunity that will allow both sides to get back to the core of peacemaking - freedom for security. Sharon is giving the Palestinians an historic opportunity – a chance for them to start building instead of destroying. A chance to demonstrate that they are making an honest attempt at establishing a good model of governance in Gaza which will lead people to believe that it can work in the West Bank. Despite the signs of hope Ross reminded all that psychologically the two sides are still yards apart. Sharon needs to contend with the opposition in his party, the settlers, and with threats to his life. At this sensitive stage it will be difficult for Sharon to concentrate on the needs of Abu Mazen. The same is true for Abu Mazen. He has major problems inherited from the inept, factionalist, and corrupt system designed by Arafat. Arafat designed this system so that only Arafat could lead it. So both sides at the moment can only realistically concentrate on their own needs. A timeout will therefore be needed after disengagement where a third party (the US) can begin to build bridges between the two sides. So what are the signs to watch out for that will signal the arrival of the pony on the horizon? Ross posed three questions, the answers to which will indicate whether things are on track. 1. What does it take for Abu Mazen to succeed? Ross says that Abu Mazen needs to display a readiness to make decisions. He needs the will to take on, change, and cooperate with Hamas on his terms. He also needs to overcome the various differences that exist within the many factions of Fatah. Abu Mazen must demonstrate that non violence works. To get people hopeful he needs to create jobs. The more he builds a model of governance that works the harder it will be for people to oppose him. Abu MAzen needs to show the world that that he can provide the rule of law in the Palestinian territories. There must be one government, one authority, and one law. Abu Mazen also needs financial aid. He needs the aid promised by the West, but more importantly he needs aid from his Arab brothers. The miniscule aid from the Arab world has been a disaster for the Palestinians. In 2002 Saudi Arabia promised the Palestinians $100 million per annum. Today their oil income has more than doubled from their income levels in 2002 when this promise was made but alarmingly they have not increased their paltry levels of aid. The world needs to be aware of the small amount of aid donated by the Arab world. It is the Arab world that leads the anti-Israel diatribe, it is the Arab world that postures for UN resolutions condemning Israel, yet they are marked only by their absence when it comes to giving the Palestinians aid. The principle of disengagement must be freedom for Palestinians and security for Israel. Before Sharon’s plan to disengage the Palestinians believed that the Israelis would never give up control and the Israelis believed that the Palestinians would never give up violence. Sharon has made a decision and he will stand by it, a decisions that will allow both sides to view each other in a new light. The Palestinians will see that the Israelis are willing to give up control. After disengagement will the Israelis see that the Palestinians are willing to renounce violence? Probably not. It will be difficult to decide whether the Palestinians are willing to do this. Their promises have historically carried much less weight than Israeli promises. With Sharon it is exceedingly difficult to obtain any commitments because he always sticks to his commitments. Arafat however, always made commitments, but never implemented them. The disengagement process is not about peacemaking. The designers of the plan are not foolish enough to believe that it will bring peace. Its intention rather, is to end the war. Only then can we rush to peace. The top three values behind the Disengagement rationale for Israel are security, Jewish majority, and democracy. Ross is optimistic that disengagement will take place but he is not optimistic that it will go well. 3. Are bridges being built after disengagement? After the disengagement Sharon will call for a timeout. He will say that Israel has just undergone a traumatic process…and he will be correct. It will be almost intolerantly painful for Israel to see pictures of people being forcibly evicted from their homes and the Israelis will need to take a step back and absorb what happened. Abu Mazen on the other hand will start pushing the Israelis in an attempt to show that it was “Gaza first” and not “Gaza last” and Europe will support him. This means that the Americans will need to allow the Israelis a pause, yet at the same time they will need to build bridges for future peaceful negotiations. Ross says that we already have a bridge to a framework for a peaceful solution – the roadmap. The problem with the roadmap is that there is not one obligation that is understood by the Israelis and Palestinians in the same way. Ross does, however believe that it is the much needed bridge because both sides accept it as a framework for a political solution. Ross believes that after the disengagement the Bush administration should promise to sit down and get an agreement of each side’s obligations in terms of the roadmap. Finally, Ross ended with the most fundamental lesson he has learned from his time as a negotiator in the Middle East – “Nothing implements itself, it always takes effort”. Peace will not be achieved by agreements made; peace will only be achieved when agreements are implemented. So to sum up, Ross sees glimmers for hope in the death of Arafat, the leadership of Abu Mazen, and the resolve of Ariel Sharon. The Spier initiative is a South African plan to help resolve the Middle East conflict by leveraging on lessons learned by South Africans during the negotiations which brought about the historic fall of Apartheid. Almost a month ago a team of South Africans, Israelis and Palestinians got together at Malmesbury for a Goedgedacht forum. At the conference sociologist Herbert Adam, who has lived and worked in Canada and South Africa for the past two decades offered 10 lessons from the South African transition. Some of the lessons are superficial at best and suggest a simplistic understanding of the last 15 years of the conflict. I will try work through all ten lessons, providing some commentary, and here, I present to you, the first two lessons. 1. Negotiations require mutual respect – usually proceeding from a stalemate – whereas Israel believes it has to defeat the Palestinians before negotiations can take place. 2. You cannot wait for violence to end before you negotiate because that puts the veto power over negotiations in the hands of extremists including agents provocateur; the ANC learned this lesson after the Boipatong massacre in 1992. The lessons are of zero value because they offer nothing new. Throughout Oslo Israel followed the strategy implied by the lessons. I will show why it is inaccurate to claim that Israel believes it has to defeat the Palestinians before negotiations can take place, how the Palestinians have failed to show respect at crucial moments, and how Israel has pursued the path of negotiations in the face of the worst acts of violence. The essence of the first point may be true, but it is certainly not a lesson that needs to be learned from SA. The basis for any successful negotiations of this nature is mutual respect. The essence of the second lesson is also true, but only if the negotiating parties are doing their utmost to stop the violence emanating from their people. It does not hold if one of the negotiating parties is allowing the violence to take place. Israel has paid the price of this lesson with the blood of their people. Looking back into history is a good way of understanding Israeli strategy. Three points suggest that Israel has in fact pursued a strategy consistent with the first two lessons. They will also highlight the risible nature of the information added to lesson 1. (1) Oslo began in 1993 with the signing of the Declaration of Principles on Interim Self –Government Arrangement. The DOP provided for Palestinian self rule in the entire West Bank and Gaza Strip for a period of no longer than 5 years during which Israel and the Palestinians would negotiate a permanent peace settlement. (2) It was in 1993 that Shimon Peres convinced Rabin to bring Arafat into Gaza from Tunisia. (3) The run up to Oslo was intense and coincided with the first Palestinian Intifada. The years after the signing of the DOP brought an increased number of terror fatalities. What does this look back at history tell us about Israeli negotiations? Bringing Arafat, their eternal enemy, back into Gaza was a tremendous sign of respect shown by Israel to the Palestinian leadership. Arafat had not changed one bit, yet Israel, against the backdrop of a violent Intifada, was willing to start negotiations. (Lesson 1). During Oslo the number of terror incidents shot up sharply. After the signing of the accords the years 1994 and 1996 saw the largest number of terrorist fatalities since the occupation began in 1967. Amazingly however, Israel pushed forward with the Oslo accords and continued the path of negotiation. The charge about Israel wanting to first destroy the Palestinians does not stand up to the test of history. Today Israel needs and wants to first destroy terror before they begin negotiations – if by Palestinians Adams refers to terrorism then its Adam’s unfair comparison and not mine. Now fair enough, Adams may feel that the Israelis have not showed enough respect to the Palestinians in negotiations, but surely the greatest example of improper respect was when Aafat questioned the basic fabric of the Jewish connection to Jerusalem, arguing to both Dennis Ross and Bill Clinton that the Jewish Temple never stood in Jerusalem, saying that it was in Nablus. This at a time when both sides were closer than ever to forging a peace deal - at Camp David and then later at the White House when Arafat rejected outright the Clinton Ideas. For negotiations to be successful both sides need to respectfully accept the religious claims of the other side. Yet in questioning the existence of the Jewish temple, the basis for Jerusalem's status as the Holiest place in the world for Jews, Arafat challenged the core of the Jewish faith and showed zero respect. These two rules actually contradict each other. Both lessons cannot hold. The second lesson calls for the Israelis to continue negotiating regardless of terror. But the first lesson requires BOTH sides to show mutual respect. Acts of terror highlight the rejection of Israel’s very existence and undercut the political strength of any Israeli government to make concessions. If the PA is not fighting terror then they are complicit in the rejection of Israel’s very existence – the worst form of disrespect. So why should Israel adhere to lesson 2, if lesson 1 is being flagrantly violated? IsraPundit is organising a webring of bloggers that are opposed to Sharon's brave disengagement plan. I won't be involved in the webring. Up to now I have skirted the issue of whether I support or oppose the transfer of 8000 Jews out of their homes, forcing them to leave their neighbourhoods, businesses, schools, friends, recreation centres, cemeteries etc. Unhappily, I support the disengagement plan. I support the plan on tactical and not necessarily principled reasons. The principled logic tells me that Israel has every right to the land it captured in the defensive war in 1967. The territories belonged to Egypt and Jordan prior to 1967. Those two states today have reneged all claims to the land so there is no-one to give the land "back" to. Israel is giving the land to a people who have waged an all out physical and psychological war on its citizens. This despite the amazing improvement in quality of life within the territories since Israel captured the land. At the inception of the occupation conditions in the territories were bleak. Life expectancy was low, malnutrition was high, infectious diseases and child mortality was rife, and the level of education was exceptionally low. Prior to the 67 war, almost 70% of Palestinian adults were unemployed. Efraim Karsh, in his book Arafat's war, explains how the situation improved almost immediately after the war. The Israeli occupation allowed the Palestinians access to the larger and more advanced Israeli economy. Close to two thousand industrial plants, employing almost half of the workforce, were established in the territories under Israeli rule. During the 1970s the West Bank and Gaza constituted the fourth fastest growing economy in the world. Under Israeli rule, mortality rates in the West Bank and Gaza fell by more than two thirds between 1970 and 1990, while life expectancy rose from 48 years in 1967 to 72 in 2000. (The average for North Africa and the Middle East is 68.) Israeli medical programs reduced the infant mortality rate of 60 per 1000 births in 67 to 15 per 1000 in 2000 (in Egypt the rate is 40, Jordan 23, and Syria 22). In addition, under a systematic program of inoculation, childhood diseases like polio, whooping cough, tetanus, and measles were eradicated. Finally, from 67 to 87, the number of schoolchildren in the territories grew by 102%, and the number of classes by 99% (the population had grown by 28%). 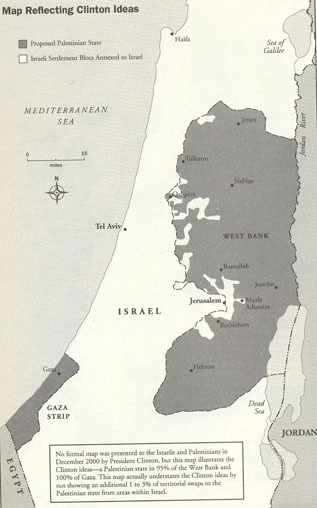 Prior to the occupation, not a single university existed in the territories. By 1990 there were 7 such institutions. Illiteracy rates dropped to 14% of adults over 15 compared to 69% in Morocco, 61% in Egypt, 45% in Tunisia, and 44% in Syria. Israel has always demanded an end to terror as a prerequisite for the establishment of a Palestinian state. Terror has not ended. It has been tempered over the past year due to Sharon's defensive measures taken to combat the intifada, primarly the construction of the Israeli security barrier coupled with the targeted assassination of terrorist leaders like Sheikh Yassin and Rantisi. Tactically, I view disengagement as the most pragmatic move for Israel. Oslo has taught us that Israelis and Palestinians will never be able to live happily together, and so the two sides must conduct a divorce to forever separate. I understand the approach taken by Natan Sharansky (who will be in South Africa today), who explains that Jews should only leave the territories when they have the choice to stay there in peace, living in a democratised Palestinian state where their rights would be protected just like Arab rights are protected in Israel proper. The problem with that approach is that I can't see it happening. That is why Israel needs to make the first move. I can't envisage any final status agreement where Israel would keep settlements in Gaza, and so Sharon is only pre-empting the inevitable. In my heart of hearts I believe we have to accept some difficult losses in order to secure the continuation of the Jewish state. It must be said...I don't believe that disengagementt will bring peace to Israel. Hamas and the other terrorist thugs will view the disengagement as a victory. They will see it as Israel withdrawing under fire, just as Hezbullah viewed Barak's withdrawal from southern Lebanon. But even so, I believe that Israel will be in a better position to protect its citizens. What's more is that after disengagement, if the Palestinians continue their violent war, they will almost certainly lose the American backing of an independent Palestinian state. For a complete explanation of why I support disengagement from Gaza read this masterful article by Norman Podhoritz: Bush, Sharon, My Daughter, and Me. Finally, although I have no issue with the peaceful opposition to disengagement, I will view any violent protestors with absolute disdain. Also, I have not an ounce of respect for those that compare Sharon's plan to the forced transfer reminiscent of Nazi Germany. Nazi comparisons from the far right are as appalling as Nazi comparisons from the far left. Beyond Images has an excellent summary of the changes in Israeli policy that have been effected since the death of the old terrorist. These policy changes dispel the myth that Israel does not wish to strengthen the moderate forces in Palestinian society. Of course, this is all taking place on very thin ice, and one more terrorist attack could move everything back to square one. Some readers have mailed me asking what was on the table at the recent summit in Egypt. The issue of prisoner releases always depicts gap between what the two sides regard as acceptable compromises. The Palestinians last week rejected an offer by Israel to release 900 Palestinian prisoners. The PA is insisting that the list of prisoners to be released include individuals that have been directly related to the murder of Israelis. Israeli opinion is divided on the issue. IDF Chief of Staff Moshe Ya'alon is prepared to release some prisoners with blood on their hands where their crimes were perpetrated before Oslo. Shin Bet Chief Avi Dichter however is opposed to any such deal. The Israeli security cabinet agreed on Thursday to hand over the city of Jericho to PA security control. Tulkarm, Ramallah, Bethlehem and Qalqilya would then be transferred gradually to Palestinian control, whilst Israel will retain security control in Jenin, Nablus and Hebron. The Palestinian leadership maintain that they are ready to assume control of all urban centres in the West Bank. The concern here for Israel is that they need to show the Palestinians that the consequence of violence will be increasing Israeli demands. At the same time, they need to reward "quiet with quiet" as Sharon put it. Many contend that for a ceasefire to have any meaning, Israel will need to refrain from targeting Palestinians known to have been involved in acts of murder, but who do not constitute an immediate danger. This view is supported by IDF Chief of Staff Ya’alon as well as PM Sharon. It is opposed, however, by Shin Bet Chief Avi Dichter. Underlying all these issues is the central question of what Israel may legitimately require from the new Palestinian Administration in order to conclude that a credible partner has emerged, and that a return to the Roadmap is feasible. For meaningful negotiations to resume the Palestinian leadership must show a real effort to challenge, defeat, and dismantle terrorist organisations committed to the destruction of Israel. Israel holds all the risk here. They have to relinquish tangible land for an intangible peace. Once the land has been relinquished, they cannot sue to have it returned even if Palestinian violence continues. A tight working schedule coupled with travel arrangements has left me little time to blog of late, but here is a short summary of the Sharm-Al-Sheik summit that took place in Egypt yesterday. Mahmoud Abbas and Ariel Sharon declared an effective cease-fire in Sharm el-Sheik Tuesday. Sharon said he and Abbas "agreed that all Palestinians will stop all acts of violence against all Israelis everywhere, and in parallel, Israel will cease all its military activity against all Palestinians everywhere." Abbas said, "A new opportunity for peace is born today....The calm which will prevail in our lands starting from today is the beginning of a new era." "We expect a declaration on the Palestinian side on the cessation of armed conflict, the intifada," said Raanan Gissin, Sharon's spokesman. "Israel will also make a unilateral declaration that says if the Palestinians cease fire, we will refrain from military activity." Gissin cautioned that in the past four years, 10 announcements of cease-fires had been followed by a resumption of violence, but added that the new announcement "has a greater chance of success than before" because of a new determination to cooperate after Arafat's death. Also worth noting is the context in which Sharon mentioned the disengagement plan, which he is determined to implement. He reminded everyone that it was born unilaterally, but that if he is convinced that a real effort to end terror is taking place then the plan will be coordinated with the Palestinians. You can see the full text of Ariel Sharon's speech at this link.